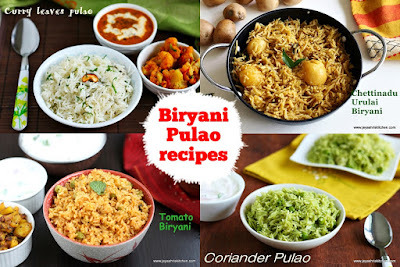 I always get request from readers to post simple recipes during festival season. 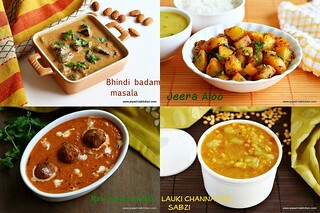 Especially for working women and moms with small babies will be benefited by such simple recipes. 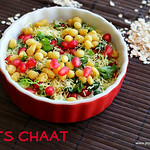 I have posted a 5 quick and easy janmashtami recipes, 2 years back. 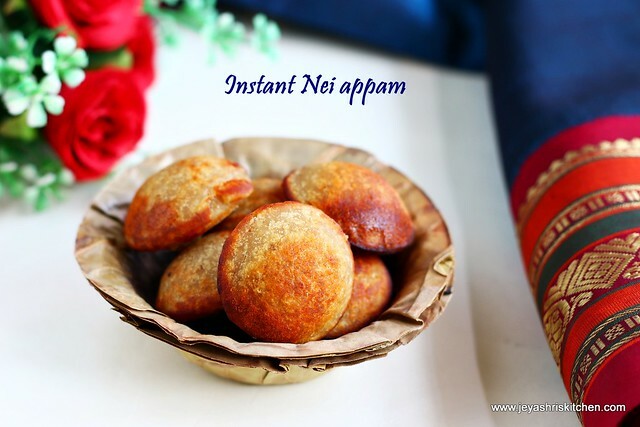 This nei appam is a instant version using rice flour. 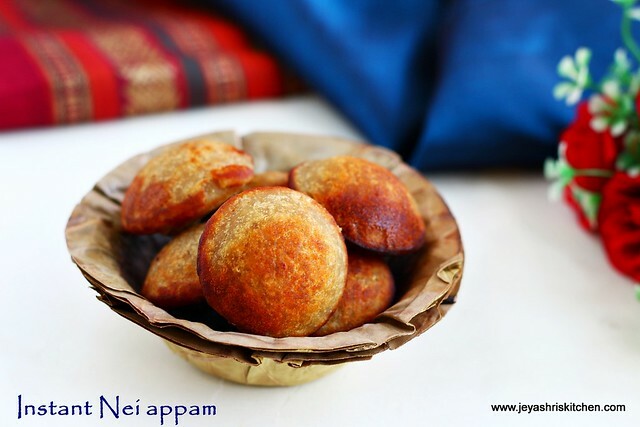 I have posted the traditional version of nei appam recipe too. 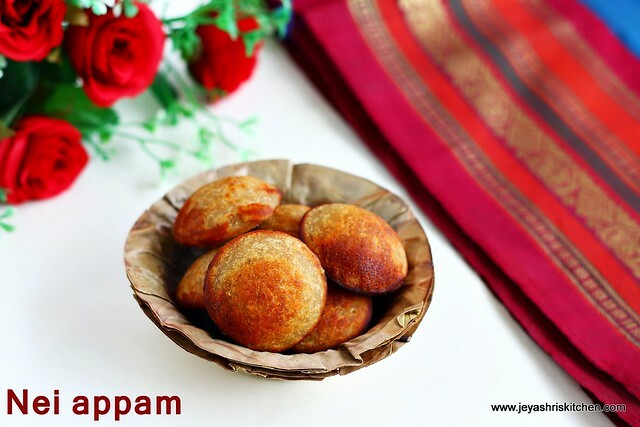 Check out my other easy appam recipe - Wheat flour appam, Nei appam recipe, rava appam recipe. 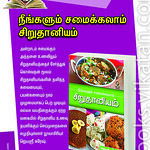 Also Check the quick Vella aval recipe . In a wide bowl add the rice flour. 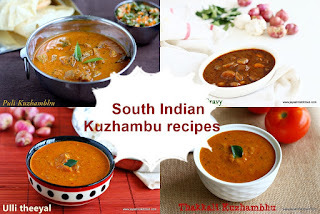 You can use store bought rice flour or idiyappam flour too. Add the coconut, cardamom powder, salt and baking soda. 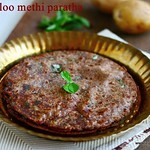 In a pan add jaggery and add 3 tblsp of water. Let the jaggery melt and when it starts boiling switch off the flame. Filter the jaggery and remove the impurities. Add it to the flour . Puree the banana in a mixer. If you can mash it well with your hands also fine. Nicely ripe banana works out well. Add the filtered jaggery and banana puree to the flour. Mix this well and keep this aside for 2 hours. After 2 hours, After 2 hours add the milk to this. I used raw milk. You can use boiled and cooled milk. 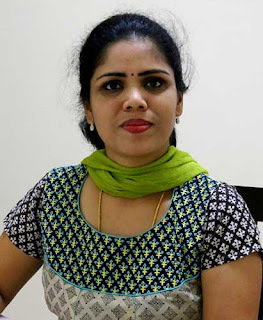 Mix well and bring the batter to a idli batter consistency. If needed add 1-2 tblsp of milk. Heat the paniyaram pan and add little ghee to each holes. Cover this and cook in a medium low flame. Once it is done on side flip the appams using a skewer or fork. 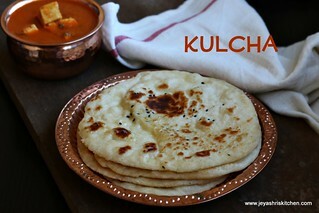 Add little drops of ghee and flip it again and keep it for few seconds and take it out from the pan. Repeat this for the rest of the batter. Instant nei appams are ready for neivedhyam. Adding bananas will give soft appams. Baking soda will make it fluffy too. Ensure that the batter is not too thick. Else you will end up in hard appams. If by any chance the batter becomes watery, add a tblsp of rava or whole wheat flour. 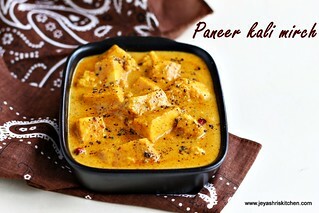 Yummy with banana pieces inbetween..